Selecting the best Amazon Kindle categories and keywords is vital in selling your ebooks. There are many ebooks and software programs, which can help your ebook sales through the use of Kindle keywords. One might think that there is some kind of magical secret that every self-published author should pay for to try and get ebook sales. Well, you don’t need to pay a cent. There is no mystery or magic to adding keywords to any Amazon product. The truth is that basic Kindle keywords are easy to find, use and implement for your own ebook. There is no magical secret formula for doing keyword research, as KDP gives very clear instructions about how to get your book into additional Amazon categories on the Kindle Store. In addition, Amazon has an in-built Amazon Kindle keyword tool for search or long-tail keyword phrase finder in its search field. 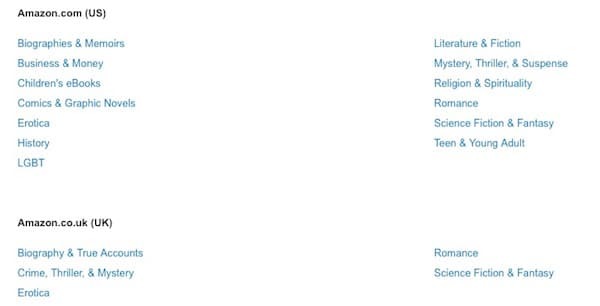 As you know, when you list your ebook on Kindle, you get to choose only two categories. So, how can you get your book into more KDP categories to help readers find your book? You can do so by using carefully selected Kindle keywords. So let’s start with adding relevant keywords to your ebook to get into more Amazon categories. You can get your book into more categories by assigning special keywords. All you need to do is follow the clear instructions given by KDP on its help page: Selecting Browse Categories. Scroll down the page and select your genre. 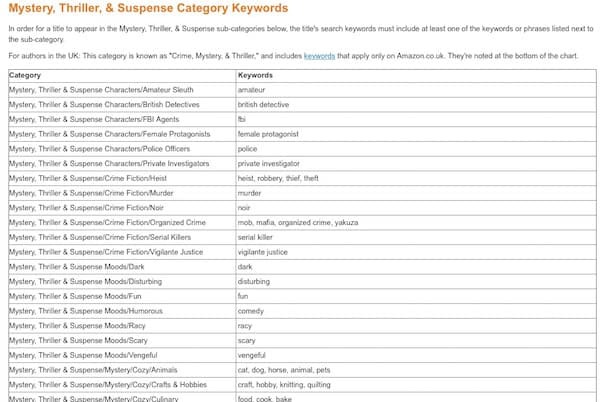 If I select Mystery, Thriller, & Suspense, I get the following list of keywords. Now, although I have my ebook in the Mystery, Thriller, & Suspense category, I can have it appear in a number of sub-categories by using the nominated keywords. For example, I could add murder or police, and have my book appear in extra sub-categories, and therefore be seen by more people and compete against fewer other titles in these sub-categories. This same list of keyword choices is listed for all major genres. So now you can get your ebook or book into more than the standard two categories or genres. I have managed to get some of my ebooks in up to five sub-categories by using this simple trick. You need to know how to discover what words people use when they are searching Amazon for things (ebooks) to buy. Search is by far the most efficient way to sell anything on Amazon. Let’s say your book is about vampires, so of course, you have this as your seed keyword. But would people who are looking for a vampire book to read search by using the word vampire? Not necessarily. So how can you find out what they might use? You can find real search terms that Amazon suggests in its search box. These are terms that real shoppers have used when looking to buy a product. In this case, a new vampire book or ebook. The image above shows the phrases, or in keyword geek speak, longtail keywords, people have used on Amazon to find vampire books. Longtail keywords are always more than one word and often three or four. You can use these word phrases for each of your Amazon keywords. Now select one or two of the suggestions from the drop-down list to use as potential long tail keywords for your book. Perhaps in this example, vampires and werewolves, and vampires and witches might be good choices as your search terms. You can keep searching for different words to find more search term suggestions that you can use. Just remember that a one word keyword will be highly competitive, so avoid them. It is much better to choose longtail keywords for your seven KDP keywords. By using the two methods above, you do not need to spend a cent on software or how to ebooks. You can get extra categories and find genuine KDP search keywords for your book. All you need to do is carefully select your seven precious keywords from both sources, and then have your ebook best positioned for buyers to find. You can also experiment, change, alter and refine your keywords and categories to your heart’s content. All you need to do is change them in your KDP dashboard and re-publish your book. So no. There is no Kindle keywords mystery. Your best Amazon keyword research tool is Amazon. Everything you need is at your fingertips, and for free. For more detailed information about Kindle Keywords, read our new article, Amazon KDP Keywords For Kindle Ebooks And Books. 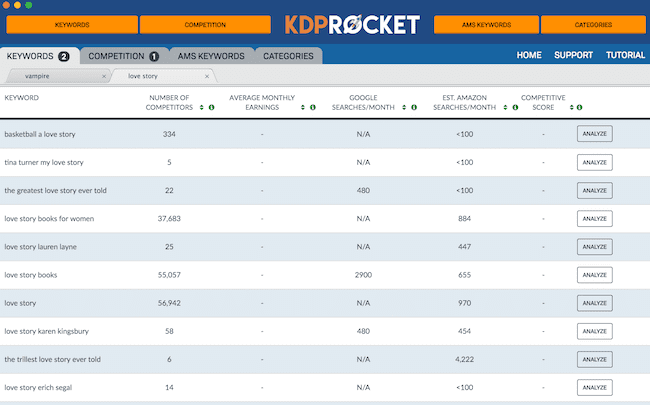 If you have a lot of titles or you want to fast track your keyword research with real-time data, you might want to investigate KDP Rocket, which is a pro tool for Amazon book keywords. If you use the Amazon search bar for your free research, you are restricted to only ten suggestions at a time. So it can be very slow going. 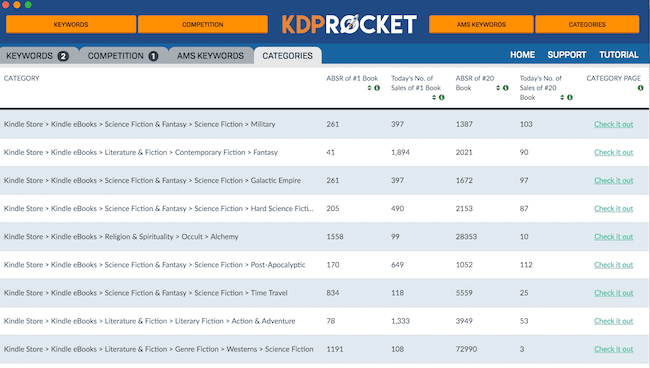 But with KDP Rocket you can access the entire real-time Amazon database to find the best seven longtail keywords and two book categories for all of your titles. You can search by sales data, price, search volume and competitors. With any keyword research, you want to find keywords that are reasonably high volume but have low competitivity. There is also data for AMS keywords to better position your Amazon Ads. By doing an in-depth analysis of your competition in your genre, you will certainly find better KDP keywords and categories to help your book rank higher and sell better. Whether you use the free method or pay to access the real-time Amazon database, both will help you and your books. The most important point to remember is that by carefully selecting your two categories and seven keyword phrases, you can increase your book’s discoverability. If you can get your book placed in a high position for less competitive search terms, your book will be seen by many more potential book buyers who have a genuine interest in your book’s theme or subject. It is the most time-efficient and cost-effective way to promote your book. So helpful – I have just published my first novel nut was feeling confused and overwhelmed by keywords and categories, and after reading this, I don’t. I’m so glad I found you – good old Twitter! Under KDP instructions for keywords, it states no need to use repeat words as you have already set them in your category. But when I follow your instructions to put in my genre in Amazon search to see the common searches. All the suggestions have the category words tied in forward and backward. Should I use these as written (with the repetition) in my keyword boxes? Yes, Julie. You need to use the additional keywords Amazon suggests to gain extra categories.